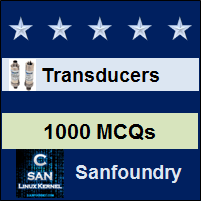 This set of Instrumentation Transducers Multiple Choice Questions & Answers (MCQs) focuses on “Measurement of Errors”. 1. Which of the following is caused by careless handling? Explanation: Gross errors are mostly due to lack of knowledge, judgment and care on the part of the experiment. That is Gross error is caused by careless handling. 2. ‘A system will be error free if we remove all systematic error’. Explanation: Random errors will remain in a system even if we remove all systematic errors. Random errors are also known as residual errors. 3. Which of the following is not a fundamental quantity? Explanation: Derived units are those expressed in terms of fundamental units. Primary or fundamental units cannot be expressed in terms of other units. 4. Which standard is fixed and used for industrial laboratories? Explanation: Secondary standards are fixed and used in industrial laboratories. Working standards as its name suggests is used for day to day measurements. International standards are accepted internationally and primary standards are used in different parts of world which will not be accessible outside for calibration. 5. Which of the following error is caused by poor calibration of the instrument? Explanation: Systematic errors are caused by poor calibration of instruments. 6. How systematic errors are eliminated? Explanation: The possible way of eliminating systematic error is the replacement of instruments. Systematic errors are caused by poor instrument calibration. 7. Which of the following represents an SI unit of luminous intensity? Explanation: SI unit of Luminous intensity is candela represented by cd. Luminous intensity is a Photometric quantity. 8. Starting position of an object is represented as x=5.1±0.2m and finishing position as y=6.9±0.3m. What will be the displacement and error in displacement? Explanation: Displacement between two positions represented as x±Δx and y±Δy is Iy-xI and error in displacement is (Δx2 +Δy2)1/2. 9. Uncertainty in quantity X is given by ΔX. Then what will be the uncertainty in quantity R for which R=c.X? Explanation: Error of a Quantity which is a constant multiple of another quantity will be a constant multiple of error of first one. 10. ‘Zero error is an indication of instrumental error’. Explanation: Zero error refers to a false indication of an instrument when the true value is zero and zero error can be treated as an instrumental error.